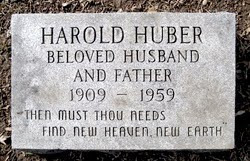 Harold Joseph Huberman (later legally Huber) was born December 5, 1909 in the Bronx. That he was an observant lad is evident by the many characters he played on screen. He was also a very bright fellow enrolling as a teenager in an advanced experimental school that was a branch of New York University that included advanced classes in all subjects and graduation in 3 years. He followed that up by studying Law at Columbia University. At some point the appeal of the law as a career was overtaken by the lure of the footlights and in 1930 the obviously determined young man appeared in his first of five Broadway productions, A Farewell to Arms. He appeared in a couple of New York shot films for Warner Brothers before moving to Hollywood. 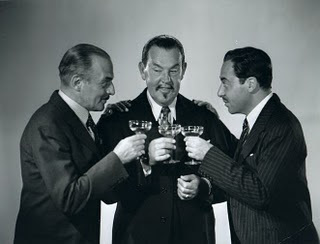 Entertainment reporters of the 30s & 40s describe Harold Huber as the antithesis of the mugs he usually played on screen. A devoted family man (wife Ethel, daughter Margaret), described by co-stars as a delightful person. An amateur fencing champion (hence the scar so handy for playing villains). A scholar (Brian Donlevy called him "the professor") with a great interest and knowledge of antiques who also spoke five languages. A busy character from his first movie in Hollywood 1932's Central Park starring Joan Blondell, Harold Huber appeared in classics such as The Match King, The Bowery, The Thin Man, Naughty Marietta, G-Men and Beau Geste. He is a welcome sight in enjoyable crime programmers and most important to this child of the late show, he is a superstar in the Charlie Chan universe. 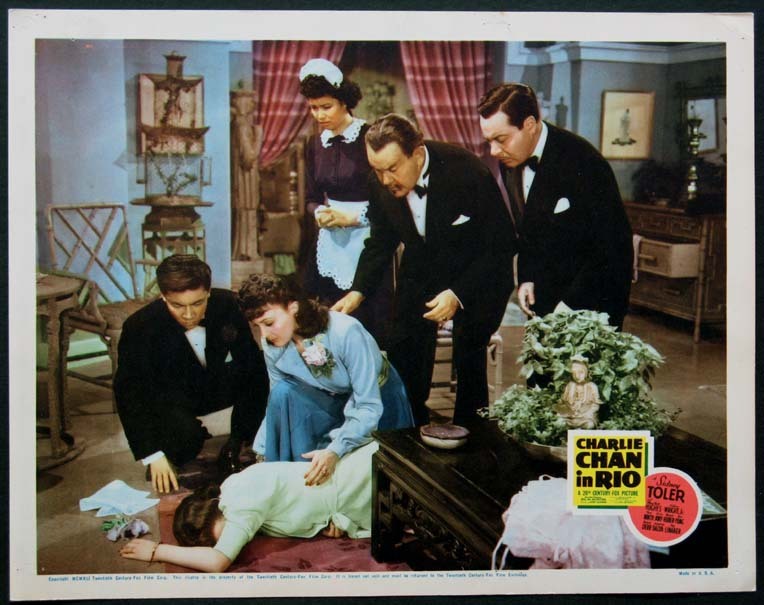 One of the best of the popular detective series 1937's Charlie Chan on Broadway directed by Eugene Forde is a snappy, slang-filled mystery with an outstanding cast. Leon Ames is a milk drinking gangster. Marc Lawrence a thug named Thomas Mitchell. Douglas Fowley as a tough nightclub owner with an eye for the ladies. 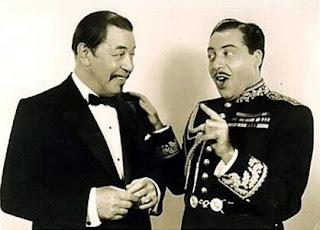 J. Edward Bromberg as a calculating newspaper editor and Canadian born Donald Woods as reporter Speed Patton, "the freshest guy on Broadway". Joan Marsh who began in silent films as a child is a Ginger Rogers/Roz Russell gal reporter. Joan Woodbury (of the soap family) is a nightclub dancer who does a routine similar to the one she did in the 1935 Hopalong Cassidy movie The Eagle's Brood. She was more sympathetic in that earlier picture. Louise Henry plays a gal who puts herself in harm's way. She does the same thing in Charlie Chan in Reno and the Philo Vance mystery The Casino Murder Case. Some girls never learn. Harold Huber is Inspector Nelson of the NYPD and he's the fastest talking slang slinger of them all. He's also a very good police officer who is not cowed by Chan's reputation and the two work in a fine partnership to solve the murders (there's never just one) as Chan and Son hit the big town. Huber is quirky and fun. I don't think a Nelson of New York spin-off would have been out of order. 1937's Charlie Chan at Monte Carlo also directed by Forde is not great Chan, but it's not bad either. It's just that this story of a stock swindle and romance among the upper crust featuring Kay Linaker and Sidney Blackmer has a pall over it as it is the last movie featuring Warner Oland. He would mysteriously walk away from Hollywood dealing with illness and personal problems and while his death would not end the series it would, for a while, end the particpation of Keye Luke. Harold Huber here plays Inspector Joubert an effusive and urbane Frenchman with a comic opera accent who assists in the investigation. Again he works well with Oland and Luke and the result of the partnership is more than satisfactory. New Chan Sidney Toler revived the series with 1939's Charlie Chan in Honolulu with the welcome addition of Sen Yung as number 2 son, Jimmy. Perhaps busy elsewhere, Yung is not featured in the same year's City in Darkness directed by Herbert I. Leeds. On the eve of war in Europe Chan reunites with old comrades in Paris and comes up against gun runners and spies. 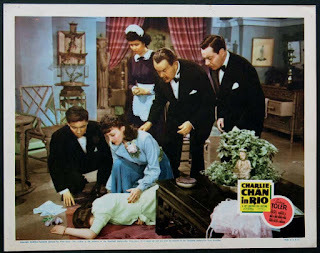 A nicely paced entry featuring C. Henry Gordon, Pedro de Cordoba, Douglas Dumbrille, Leo G. Carroll, lovely Lynn Bari and in a non-speaking bit the same year he broke out in Of Mice and Men is Lon Chaney, Jr.
To Harold Huber fell the job of comic relief. I have acquaintances who do not care for his work in this movie. I am not of their mind. Perhaps it is because I like Huber or that I have a soft spot in my heart for those who toil as comic relief. 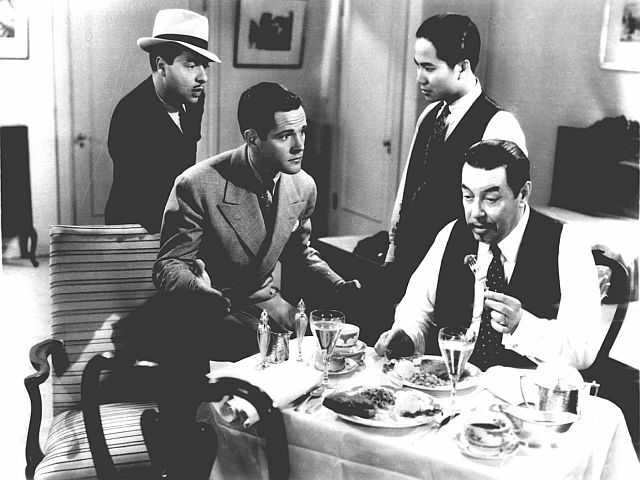 Huber's character, Police Inspector Marcel Spivak, is a combination Charlie's boys and his annoying early assistant Kashimo put together in his eagerness and ineptitude. He can't deal with the public, the crooks or the blackouts as he fumbles, bumbles and gets pushed around in his effort to keep up with Chan mentally and physically. I can't help but think of him as the emotional Pere de Clouseau, and I get a kick out of the work. Harold Huber's last Chan picture, Charlie Chan in Rio directed by Harry Lachman is a reworking of 1931's The Black Camel and features the earlier movie's director Hamilton MacFadden as an amiable drunk. Victor Jory is a phoney psychic and Mary Beth Hughes and Ted North, who would be briefly married, are featured. This is an early outing for cinematographer Joseph MacDonald (My Darling Clementine, Panic in the Streets) and you can tell the young man will be going places. Chief Souto is an investigator back on equal footing with the visiting Chan. He's a friendly and efficient sort who helps the case along. Respectful of Charlie, patient with Jimmy and confident of his own skills. Movies would continue to be a part of Harold Huber's career, but it would also include radio where he was the leading player in The Adventures of M. Hercule Poirot aka Agatha Christie's Hercule Poirot which can be found on myoldradio.com, if you're in the mood for a little tea and murder, and in 1950 starred in a short-lived television series I Cover Times Square. On Septemper 29, 1959 Harold Huber passed away during surgery at the Jewish Memorial Hospital. His film roles tell us all we need to know about the actor. His headstone tells us all we need to know about the man. Wow! I now know so much about one of my favourite actors. When Harold Huber is in the credits, I know it will be an entertaining movie. Fantastic to learn about his background. I first saw him in the Chan films. When I saw 'The Thin Man' I remember thinking, it's Charlie's friend. He comes across as such a fun person. I hope you get the chance to listen to some of the "Poirot" episodes on old time radio. I'm sure you'll enjoy listening to your friend Harold. This was a great piece on an actor who makes even underwritten roles interesting. I had no idea that Harold Huber had such an erudite background! Thanks so much for sharing your infectious enthusiasm for supporting players, Caft. Btw, I found the recordings of his Hercule Poirot very entertaining. In my movie universe it's all about the character people. Supplement Portal Meals journals assist people see how a lot they're really eating, and establish any patterns that lead to overeating or snacking on unhealthy foods. In these articles I will inform you all the small print of a healthful and balanced way of life: nutritious diet, physical exercise and psychological points. It is a deeper complete physique cleanse Supplement Portal natural nutritional vitamin supplements that once you correctly observe the instructions you'll obtain a complete physique cleaning and higher Supplement Portal. For those of you who think weight is meaningless and it's all about body fats, take into account that number wasn't budging both. The truth is that there's not a wholesome means of creating strong muscles or getting a flat abdomen for 1 and even for 6 months when on the same time you've got excessive share of fat. One of the biggest mistakes individuals make when starting an exercise program is doing an excessive amount of, too soon. Over time, users can observe their performance and Supplement Portal. It is necessary to get someone who is heavy and needs to reduce weight for health causes to start to think differently about how they look.